Changing Course is a campaign that tells the climate change story through an Asian lens. 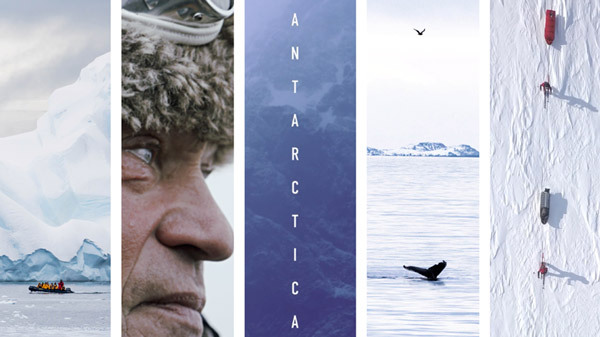 The centrepiece is a film and photography exhibition documenting the ClimateForce: Antarctica 2018 expedition in March 2018. This was led by Sir Robert Swan, a British environmentalist and explorer who was the first man to walk to both North and South Poles. As the last pristine wilderness of our planet, Antarctica officially belongs to no one — yet everyone has a stake in it. This remote continent is a window into both our past and future, and it is trying to tell us something. A giant, ice-covered landmass about a third the size of Asia, Antarctica’s existence is under siege. Rapid collapse of the Antarctic glaciers — due to accelerating climate change — could flood coastal cities from Jakarta to Shanghai by the end of this century.Higher tides could bury every shoreline across the globe and create hundreds of millions of climate refugees. Asia will bear the brunt of this, and this change could happen too quickly for the human race to adapt. This is why Antarctica matters. 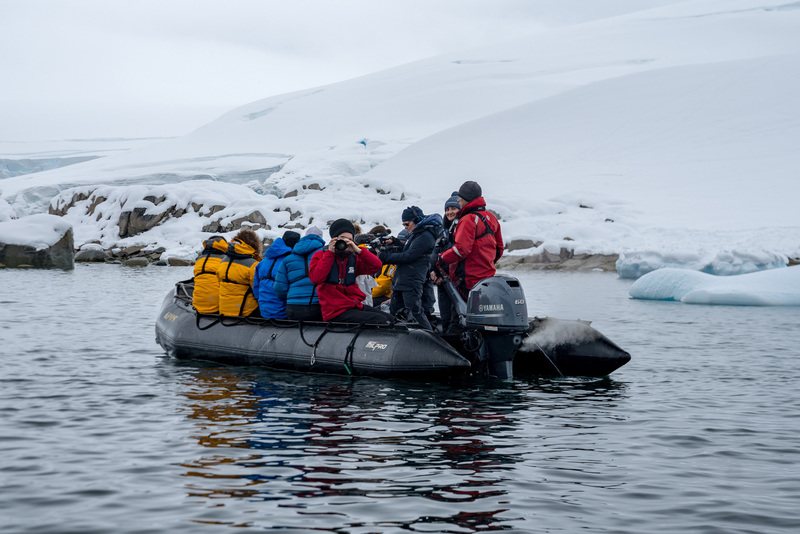 ClimateForce: Antarctica 2018 gathered some 90 people from around the world to learn from the planet’s most mysterious continent and understand why its fate is tied to humanity’s.This exhibition documents the beauty and fragility of this inhospitable place, tells the stories of those defending it, and hopes to inspire people to live more sustainably. Our journey begins in Singapore, a city-state one degree north of the equator in Asia. The region, home to most of the world’s poor, is extremely vulnerable to climate change impacts. Southeast Asia in particular recently suffered the worst drought in decades with crippling heat waves and water shortages occurring across the region. In Malaysia, water levels in the Linggiu Reservoir in Johor Bahru – where Singapore also draws water from – had fallen to historic lows in 2016. 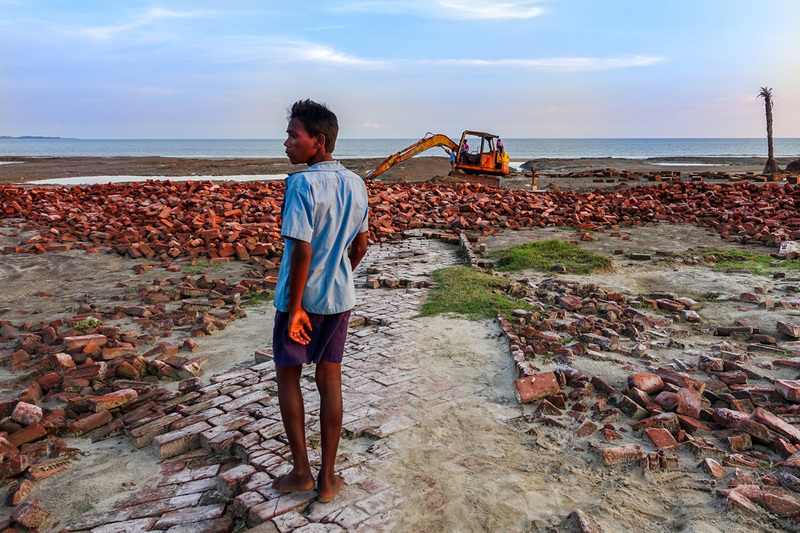 Apart from droughts, unchecked warming could also put the future of the region at risk of increased storm surges, coastal erosion and flooding, which could displace millions of people, destroy millions of hectares of arable land and result in economic losses of billions of dollars.This has already decimated entire villages in some locations such as the rapidly-sinking Sagar island, part of the larger Sundarbans in the Bay of Bengal, where communities have lost their ancestral homes and been forced to migrate. 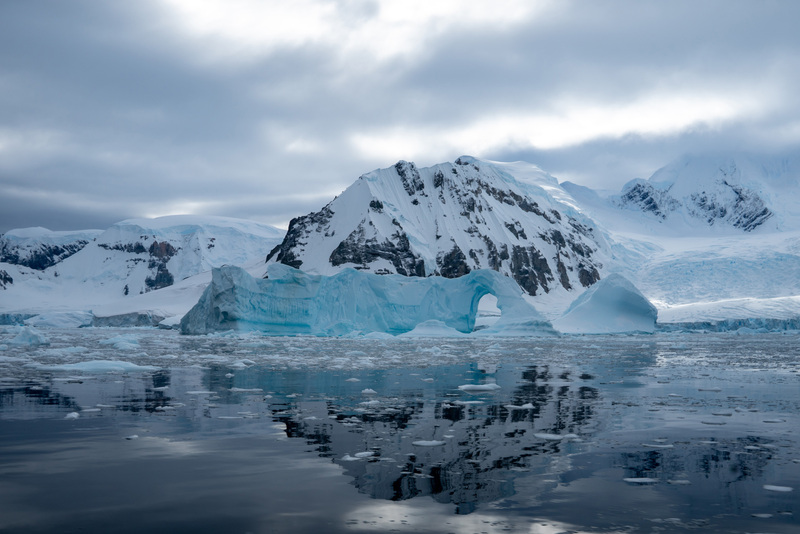 Meanwhile, the Antarctic Peninsula – the northernmost tip of the seventh continent – is warming up more rapidly than anywhere else on earth, with temperatures increasing by nearly 3 degree Celsius over the previous 50 years. 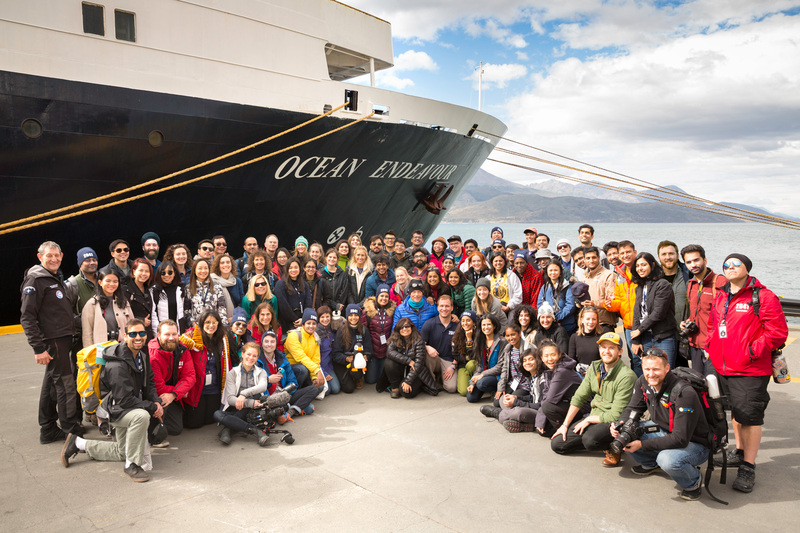 In March, we took a 42-hour flight from Singapore to the tip of Argentina in Ushuaia to join some 80 people from all over the world to board our vessel, the Ocean Endeavour, for the ClimateForce Antarctica 2018 expedition. 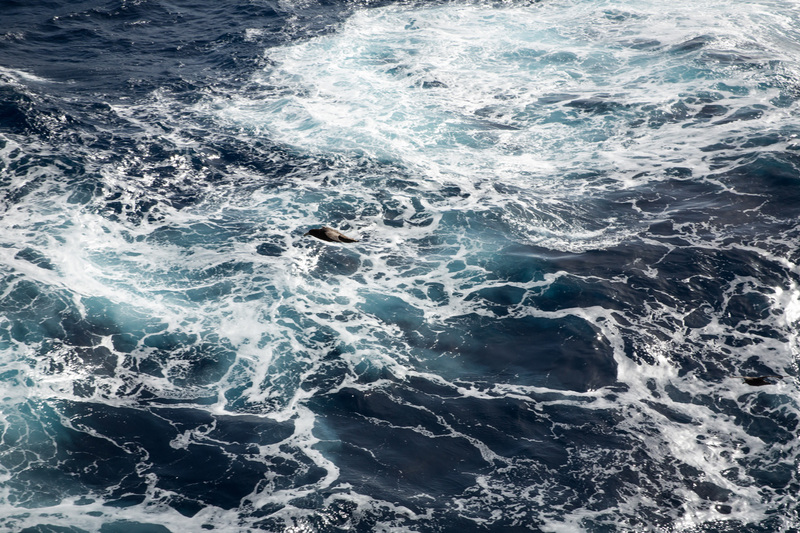 Over two days many of us suffered severe sea sickness as we crossed the Drake Passage, one of the roughest seas on earth, to reach the northernmost tip of Antarctica. The passage earns its reputation from the lack of any significant land at the latitudes of the Drake Passage, which results in unobstructed currents churning beneath the sea, swallowing ships and claiming the lives of many sailors over the centuries. We crossed that imaginary line in the ocean that marks the Antarctic Circle – at 66°33′47.2″ south of the Equator — far further south than most people would ever go. At a small ceremony to mark the crossing, we learned that in 1773 James Cook was the first human being known to have crossed the Antarctic Circle, and it is on the shoulders of these explorers that we discovered this place. With this privilege comes a responsibility, Swan shared. Once you’ve experienced the continent, you become its ambassador. The question on our minds: What does it mean to care for an icy wilderness far from home? Antarctica is the only continent on Earth without a native human population. It is defined as all of the land and ice shelves south of 60°S latitude and is protected by the Antarctica Treaty, which entered into force in 1961 and has 53 parties. The treaty assigns Antarctica as a scientific preserve, establishes freedom of scientific investigation and forbids military activity on the continent. 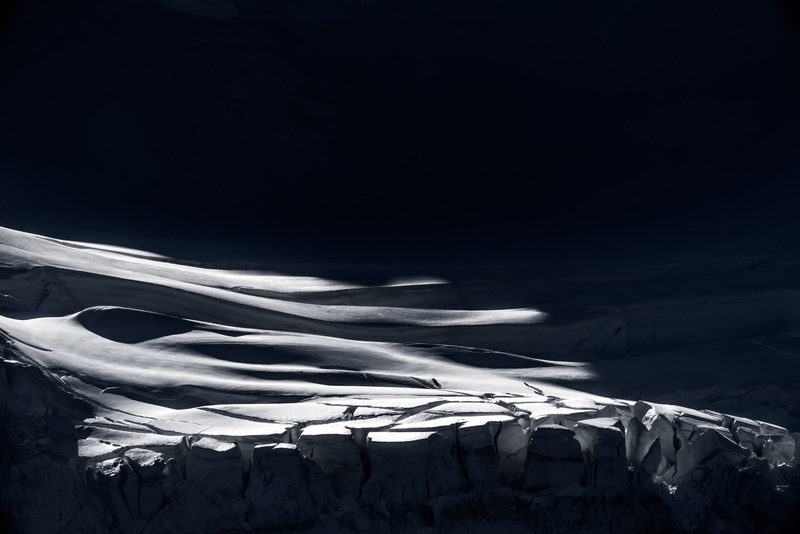 Since its discovery, Antarctica has been a prime spot for scientific research. Due to its isolation, the continent is among the most untouched places on Earth, making it highly valuable to biologists, geologists, chemists, glaciologists, and above all, climate change researchers. In 2002, the Larsen B ice shelf, an area of ice 4.5 times the size of Singapore collapsed. This has not happened for at least 10,000 years. In 2004, researchers discovered bubbles of ancient air trapped in an ice core that confirmed the connection between rising levels of greenhouse gases and higher temperatures.They showed that carbon dioxide levels in the atmosphere today are higher than they have been for at least 800,000 years. 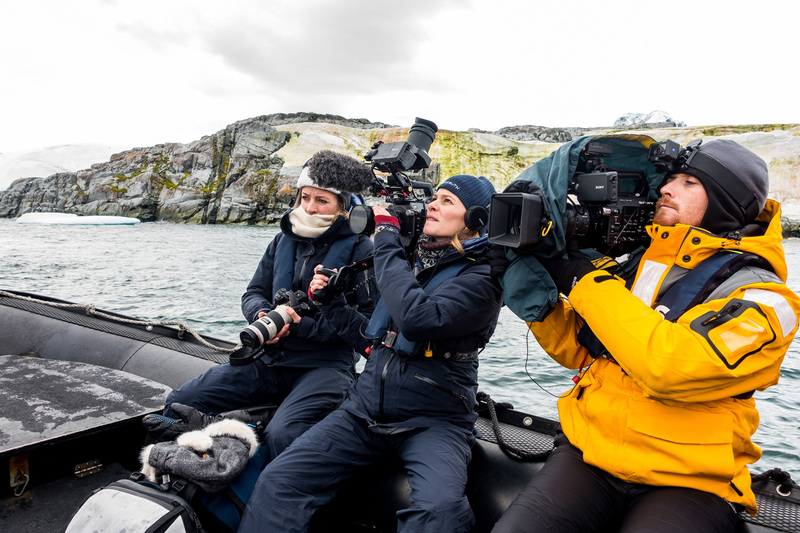 On the expedition, we were out on speedboats known as zodiacs exploring the islands when we heard what sounded like a loud crack and thunder reverberating across the ocean. We turned to look and in the distance was a monolithic iceberg the size of a building block crumbling into the sea. Antarctica is telling us beyond doubt that human activity is changing our atmosphere.In 2017, it shed one of the largest icebergs the world had ever seen. This ice shelf, Larsen C, was four times the size of London. The West Antarctic Ice Sheet ­– based on slippery wet rocks – is visibly weakening and melting as warming water laps perilously at its soft underbelly. 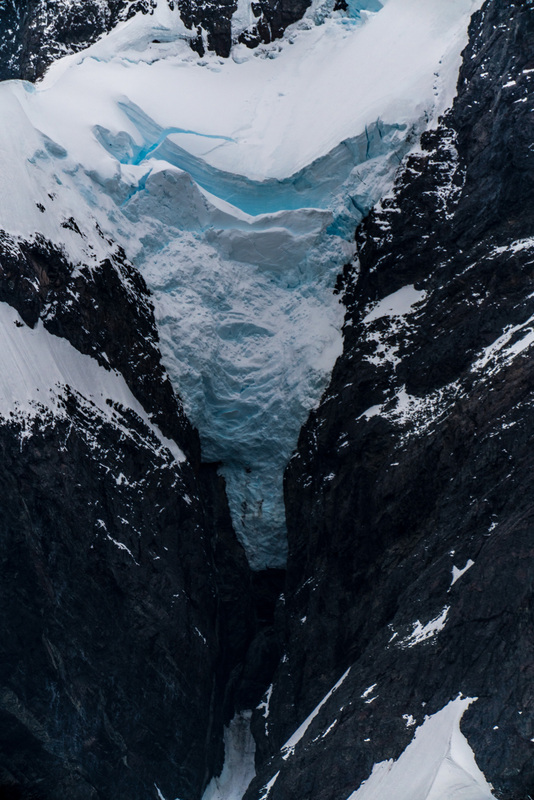 In recent years, scientists have identified marine ice-cliff instability as a feedback loop that could trigger the disintegration of the entire West Antarctic ice sheet, at a speed much quicker than previously thought. The collapse of these giant ice sheets could spell disaster: Instead of an estimated three-feet rise in sea levels by the end of the century, scientists are predicting that a six-feet rise is more likely if humanity doesn’t rein in its impact. 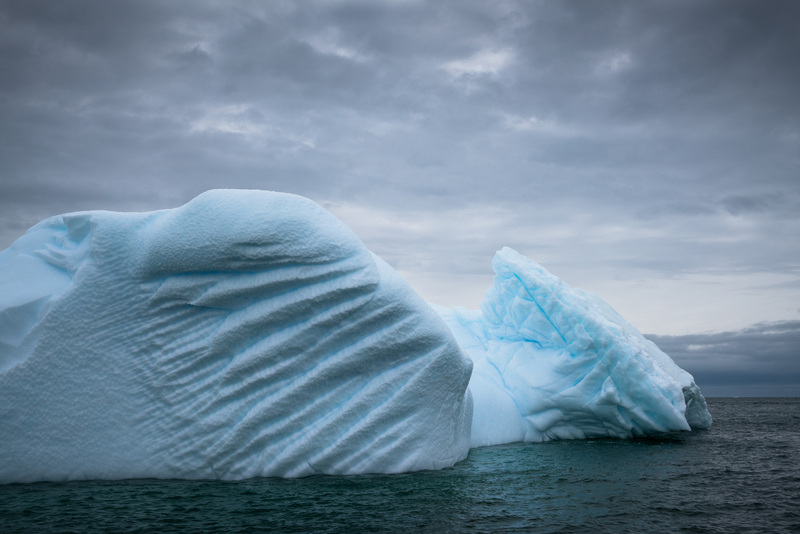 If carbon emissions continue to rise at the current rate, the melting of Antarctica’s ice will raise sea levels by 3.5 metres, flooding major coastal cities around the world. The world’s fifth largest continent has no permanent residents. People who travel or live in Antarctica are those who work in scientific research stations or tourists. Antarctica has no commercial industries, no towns or cities. About 30 countries maintain about 70 research stations in Antarctica, which has a population of about 4,000 in summer and 1,000 in winter. On Detaille Island in Lallemand Fjord in an area known as Crystal Sound, we explored a historic site where the British Antarctic Survey Station W was established in 1956 for research in the areas of meteorology, topographical survey and geology. The base has a brief and exciting history as a sledging base and over three years, researchers and dog teams covered distances of up to 4,000 miles, mapping the area for the first time. Abandoned in 1959 because severe ice conditions made it impossible for supplies to reach the base, the buildings have been frozen in time, with coats, boots and skis left by expeditions of decades ago. As we explored the rooms of the research hut, we caught a rare glimpse of what life was like in this frozen wilderness in the 1950s when the Antarctic Treaty was signed.Today, the island’s only residents are a large colony of Adélie penguins, who breed farther south than any other penguin species. The relative accessibility of the Antarctic Peninsula has also meant that Detaille Island has the longest record of exploitation on the continent, where human activity is most evident.Around the peninsula, traces of Antarctica’s whaling industry, which thrived in the early 20th century, are evident on some of the islands such as Enterprise Island, at the north-eastern end of Nansen Island in Wilhelmina Bay. Whales were hunted to the brink of extinction for their oil and bones, and even though commercial whaling was banned in 1986, the number of whales today is still a fraction of what it once was. Currently, the only permitted commercial activity is tourism. 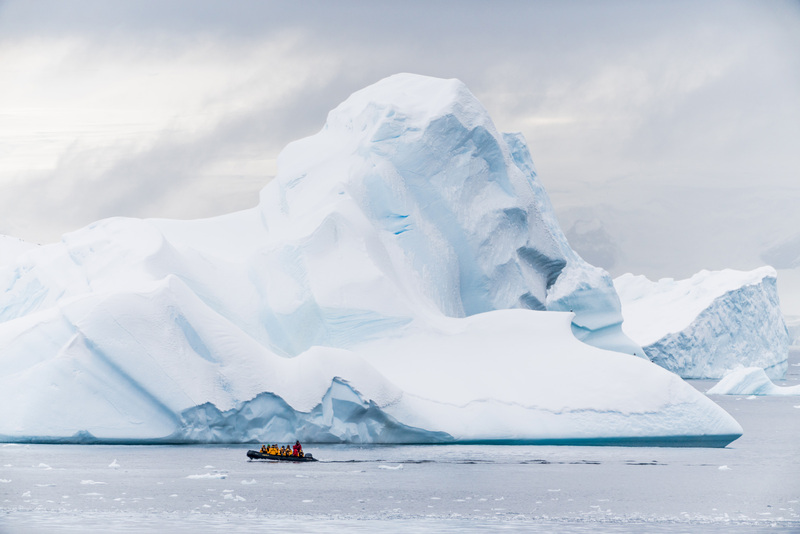 Every year, small expedition vessels such as ours carrying around 100 passengers looking for adventure sail to Antarctica during the summer months. 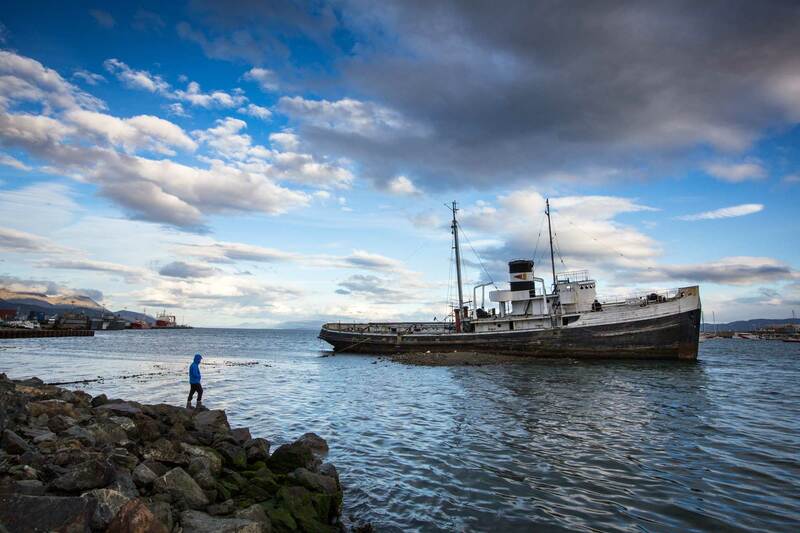 Strict rules govern their operations – no ships are allowed to discharge anything in the water below 60 degrees South, and before being allowed off the ship, we are warned sternly about approaching wildlife. We have to wash our boots before and after landing; we take nothing with us, and leave nothing behind. 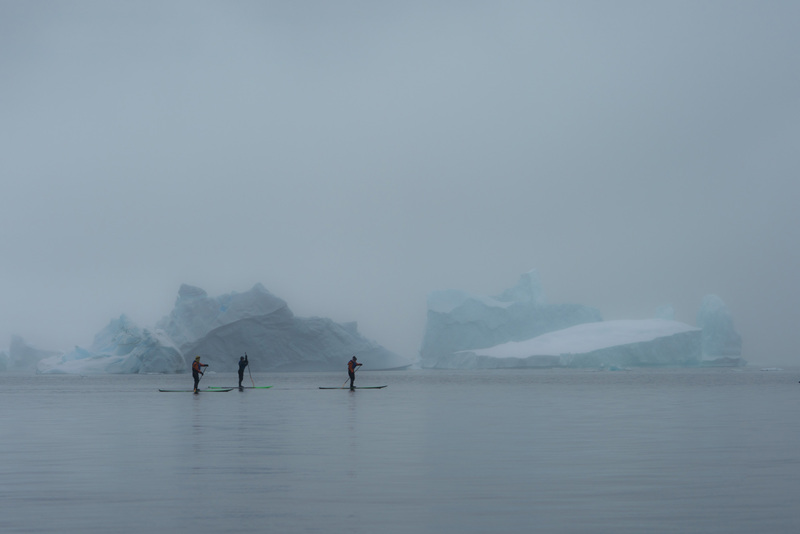 Occasionally, when the weather permitted, a few of us managed to get out to paddle board or kayak in the Antarctic ocean, getting up close and personal with this magnificent, desolate seascape. The Antarctandes, also known as the Antarctic Peninsula cordillera, is the mountain range that spans over 5,000 kilometres that is located on the northern Antarctic Peninsula, in the Graham Land and Palmer Land regions of Antarctica. Most of the peaks in the region remain unclimbed and untouched, with some notable peaks being Mount Castro, Mount Coman, Mount Gilbert, Mount Jackson and Mount Hope, which is the highest peak in the peninsula at 3,239 metres — less than half the height of Mount Everest.The mountainous terrain has long hindered exploration of the high plateaus of the peninsula’s interior, earning it names such as The Forbidden Plateau, The Catwalk, The Amphitheatre and Blow Me Down Bluff. These mountains are considered to be a continuation of the Andes of South America, with a submarine spine or ridge connecting the two. As we tried to comprehend the scale of these mountains, we thought about how early explorers of the continent such as Norwegian Roald Amundsen must have felt when they laid eyes on them for the first time. One rare, sunny morning, we sailed into the Lemaire Channel, a popular destination for cruise ships which is nicknamed “Kodak Crack” due to its spectacular views of steep mountains on each side. 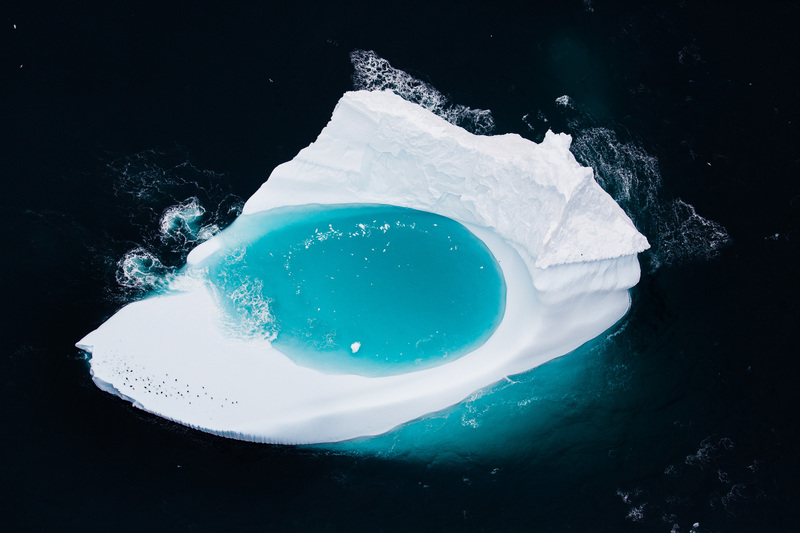 The 11 km long channel – just 1,600 metres wide at its narrowest point – is an iceberg factory, with icebergs of all shapes and sizes in different shades of white, blue, and green glistening in the sun. The peninsula has a sharp elevation gradient, with glaciers flowing into the Larsen Ice Shelf, which experienced significant breakup in 2002. We encountered steep glaciers which flow downward and create a Stegosaurus’s back of icebergs on both the west and east coasts. The glaciers morph from plateaus, flowing between rocky mountain peaks. These include the George VI Ice Shelf, Wilkins Ice Shelf, Wordie Ice Shelf and the Bach Ice Shelf. These ice packs are melting visibly. 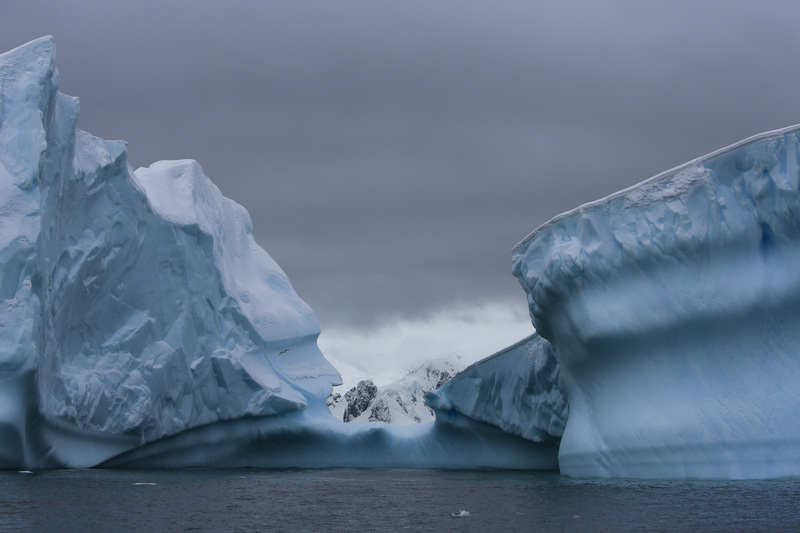 Seven ice shelves along the Antarctic Peninsula have retreated or disintegrated in the last two decades. According to the British Antarctic Survey, glaciers on the peninsula are not only retreating but also increasing their flow rate as a result of increased buoyancy in the lower parts of the glaciers. As we soaked up the sights and sounds of Antarctica’s mountains and ice, it dawned on us that what happens here is closely intertwined with the fate of the rest of the planet. Antarctica is the coldest continent on Earth and holds the record for the lowest temperature ever recorded on this planet: -89.6 degree Celsius. While the continent's harsh climate and the vast ice sheets make it an inhospitable place for most living things, it still boasts a rich ecosystem above and below water. Plant life is dominated by various forms of mosses, lichens and algae; and the animals of Antarctica include seabirds, seals, albatrosses, penguins and whales. 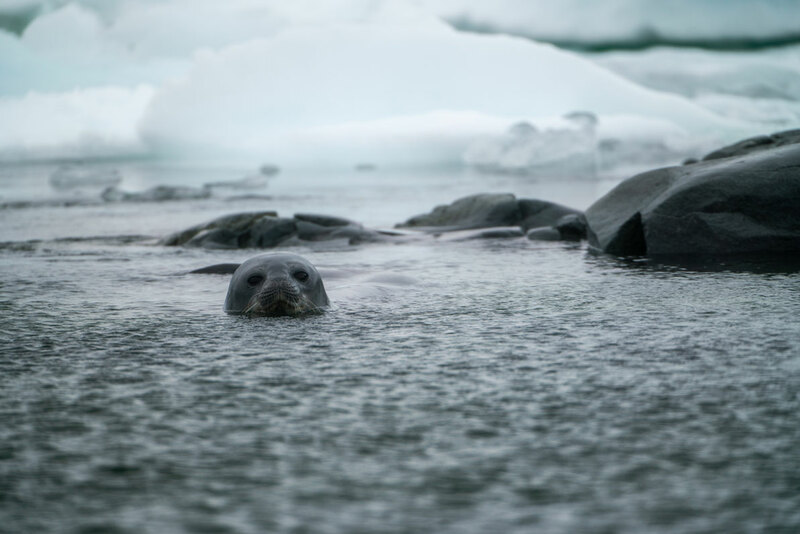 Unaccustomed to humans, the penguins and seals we encountered on Antarctica’s shores were unperturbed by us. On the Yalour islands, south of the Argentine Islands in Penola Strait, we were greeted by thousands of Adélie penguins – cute Antarctic icons marked by a white ring surrounding the eye. The feisty creatures look like statues from afar, but they burst into life once up close, zigzagging across ice and rock as they inspected us curious visitors. Often, we would spot a mother and baby pair feeding, with the elder penguin opening up its beak dramatically wide and regurgitating food that the younger penguin would lap up. 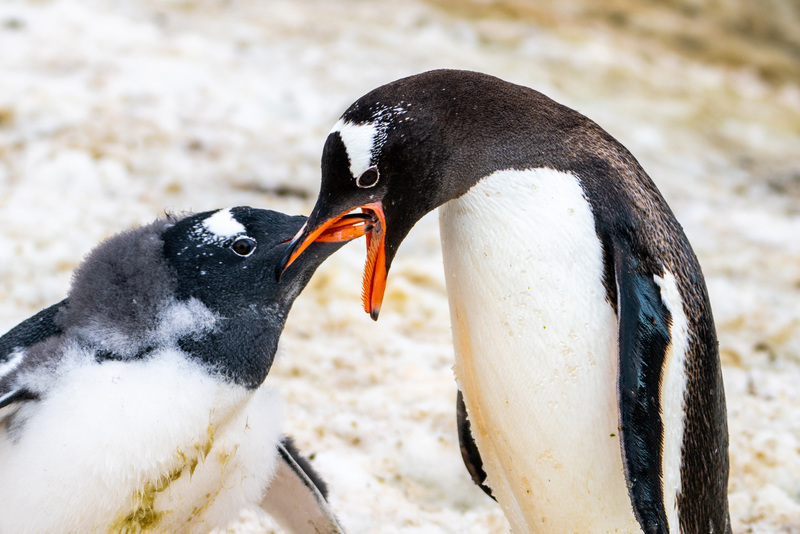 Other times, we saw pairs of penguins slapping each other — apparently a bonding ritual. These animals feast on the Antarctic’s supply of food in its deep waters, especially krill —small shrimp-like crustaceans which in turn are nourished by phytoplankton, a type of microalgae abundant in the continent’s waters especially during the summer with 24 hours sunlight.But this ecosystem is being impacted by climate change. Krill depend on the presence of sea ice for their livelihood; they eat the algae that grows beneath it and their young gather under its protection. As temperatures rise and sea ice decreases, the populations of krill have declined significantly around the West Antarctic Peninsula. Adélie penguin populations have also been declining as a result, and changing weather conditions further disrupt their traditional nesting areas and patterns. The undersea landscape of Antarctica – home to a rich fauna of marine invertebrates – are similarly not spared. Researchers studying the effects of warming on the cold-blooded creatures such as ten-legged starfish, antifreeze fish, sea spiders and clams, find that they are sensitive to small changes in temperature and are struggling to cope. One morning, we turned off the zodiac engines to sit in total silence and were treated to a minke whale coming up close, blowing air and water through its blowhole, composing a magical symphony of sounds. Reading about climate change is one thing, but witnessing Antarctica's fragility and getting up close to its wildlife on such a personal level was an entirely different experience that was both inspiring and sobering. It was the moment we had all been waiting for – to set foot on continental Antarctica. On Day 10, we made that fateful landing at Portal Point, at the entrance of Charlotte Bay on the Reclus Peninsula. Fresh snow had fallen overnight, providing a white playground where we made snow angels and had snowball fights. 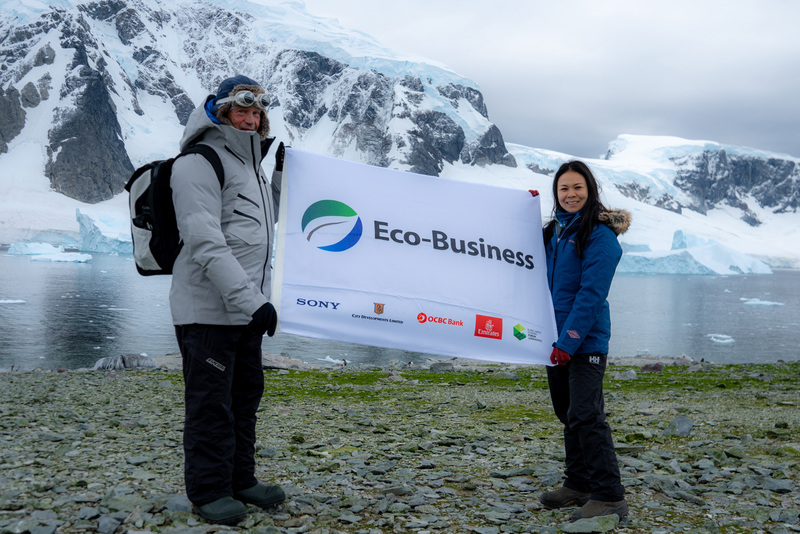 The expedition members unfurled national flags, organisation slogans, and one even unpacked a 3D printed wind turbine made in the colours of India’s national flag — all of us driven by a desire to mark this achievement in one way or another. With no phone signal, no internet connection and no contact with the outside world, we were all forced to confront ourselves, each other, and Antarctica’s vast, desolate landscape.While we all had different ways of experiencing the continent, something beyond the physical connected us all: We had never felt this close to Mother Nature. 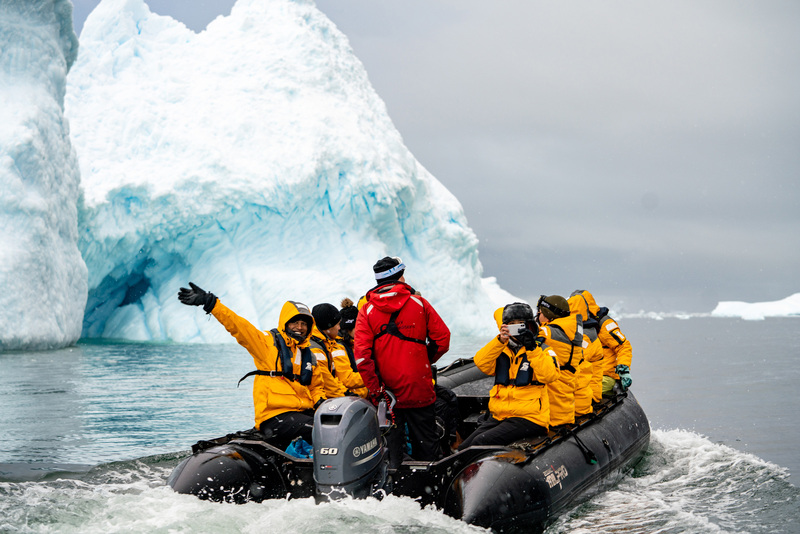 Through our daily excursions, we felt Antarctica’s icebergs, waves, wildlife, islands and mountains assaulting our senses and pervading our minds. We kayaked, paddle-boarded, trekked, climbed, filmed and photographed our way through the sub-zero temperatures, snow, hail, rain, fog and sunshine. 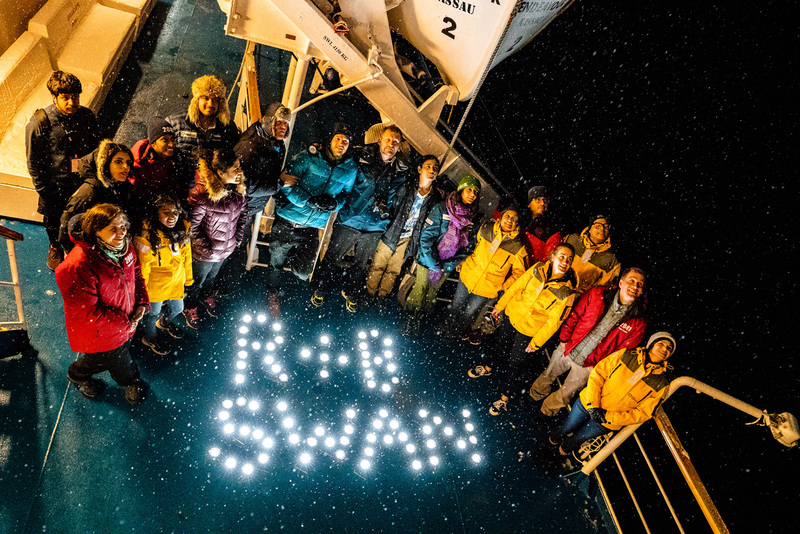 We even embraced its icy waters when on Day 7, our ship lowered its shell doors for us to take the Polar Plunge – a challenge to jump into Antarctica’s -2 degree waters for a quick swim. Harnessed to the ship with a rope, we took turns to jump in. It was like being punched with ice. Our faces and our minds froze on contact with the icy water, and we scrambled to get out as quickly as we went in. One night, we sailed into the blackest of nights on a calm, waveless sea and a thick blizzard enveloped us. 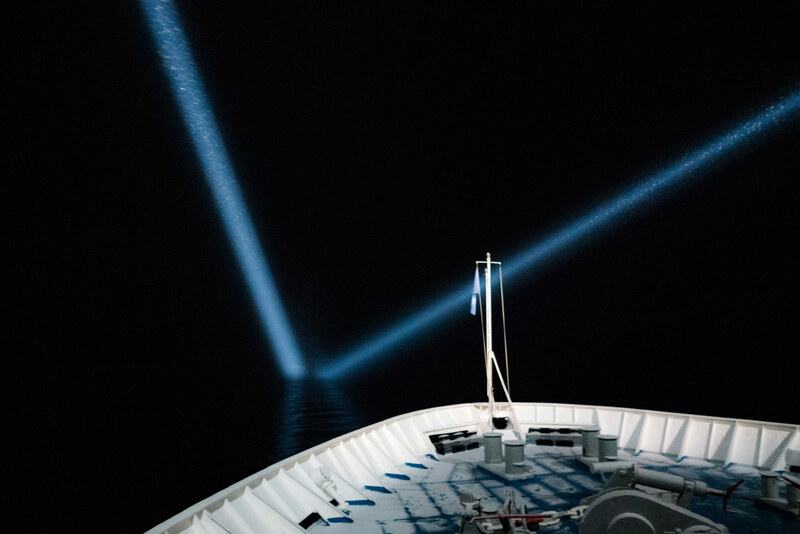 Snowflakes rushed out of the void and into the giant blue beams of light, which shot out from the ship’s top deck, scanning the black sea for icebergs. It felt like an alien world, with no division between sea and sky. 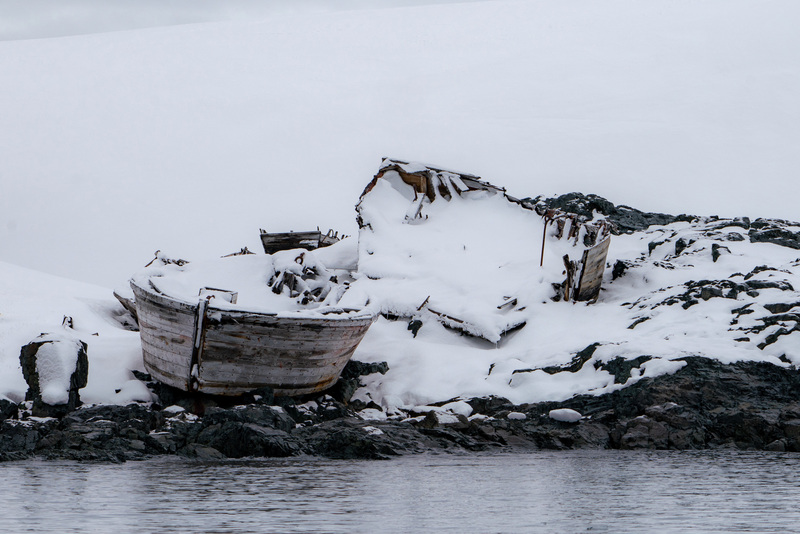 We felt very far away from home, and developed a new-found respect for the early explorers who sailed into Antarctica on wooden ships and without modern technology to guide or protect them. Out of this darkness, we composed messages of hope — words shaped by the light of solar lamps — gifted by our friends from Abu Dhabi who wanted each of us to remember our mission to be shining beacons of positive change back home. None of us would be the same again. Antarctica is one of those truly life-changing places. We journeyed to the end of the Earth to find a mirror in which to inspect ourselves. This magnificent landscape has a way of reminding us of man’s hubris and impermanence. Antarctica does not care what we do – it can kill you without hesitation.If we refuse to listen to it, keep exploiting it, it will teach us a lesson.All its ice can melt, and Antarctica will still be there. The question is: Will we? This climate change initiative would not have been possible without our partners. We’d like to thank all of them for their support in this campaign to inspire meaningful change in the world. All the assets in this film and photography exhibition were shot entirely with Sony equipment. This exhibition is certified carbon neutral.